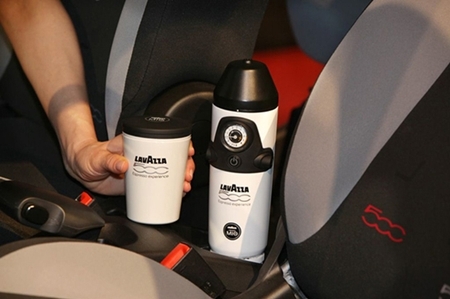 One of the more ridiculous optional extras in the automotive world is Fiat’s latest tick the box for an espresso machine, which comes with matching cups, and has been made for Fiat by the Italian coffee company Lavazza – known as “Italy’s favorite coffee” and uses the company’s “A Modo Mio” coffee pods. The car which can be optioned up for ‘espresso on the move’ is the about to be released Fiat 500L. This L(onger and Larger) version also sports four doors, similar to the MINI Countryman, which is not “mini” any longer. 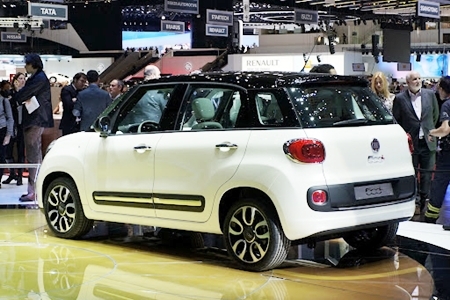 However, at the presentation of the car in Turin this month, Fiat announced that the 500L will be “the first standard-production car in the world to offer a true espresso coffee machine.” Talk about a useless option! Perhaps MINI might like to come out with a cheese grater in the Countryman, equally as useful on the move. Fiat says the machine “is perfectly integrated in the car with a deck designed expressly by Fiat.” But if you think this is some very Latin idea, the Fiat 500L is being built in Serbia. Would the coffee maker be a distraction, or is it a safety feature to keep the driver awake and on the ball?